In Shiver, Grace meets Sam, the sensitive boy who loves poetry and music and soon discovers that he is one of the wolves in the woods behind her house. In order to be together, they must find a "cure" to prevent him from turning into a wolf whenever the weather turns cold. In this second installment of the Wolves of Mercy Falls series, Grace and Sam must fight a force that initially seems less powerful than how to get Sam to stay human. In this book, Grace's parents become the main antagonizing force that is keeping them from being together, choosing now to parent their daughter even though they left her to raise herself almost her entire life. As the story unfolds and her parents continue to become more and more insistent that she never see Sam again, Grace must come to grips with the knowledge that something is happening inside her own body that might be more devastating than her misguided parents' quest to keep her from Sam. I listened to the audiobook of Shiver a few months ago and was not going to continue with the series after that. It wasn't that I thought it was a bad book, it's just that I've always been a paranormal romance skeptic. I think Stiefvater is a hugely talented author who writes beautiful, lyrical prose, but her lovely writing wasn't enough to pull me into the genre. But then a few days ago, I discovered that Maggie was coming to Michigan as part of her Forever book tour and it was like a switch had been triggered in my mind that I was supposed to finish this series and go to the signing. 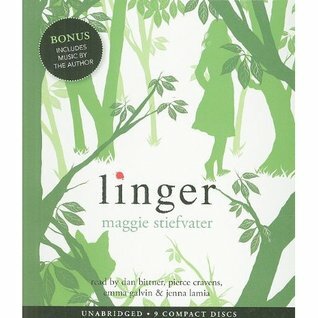 I promptly requested the audiobook of Linger from the library and purchased a copy of Forever so I could read it as soon as I finished the second book. Despite my initial doubts, Linger shockingly pulled me into the Sam and Grace's story more than the first book did, perhaps because this book is more of a character study than anchored by a suspenseful, fast-paced plot. This book had more of a quiet power to it and gave us more time to sit with all of the characters as individuals, which is something I have always preferred as a reader. Some people have commented that the introduction of Cole and Isabel as narrators seemed to detract from the story, but I wholeheartedly disagree. I think their strong characterization was a great asset to the story, and helped keep readers like me, who are not huge fans of romance to begin with, interested and appreciative that this world that Stiefvater built is much bigger than just Sam and Grace. The audiobook of Linger was a wonderful presentation, and I was pleased that they chose a different actor to narrate for Sam this time. He sounded a tad more young and innocent than I imagine him in my mind, but he was still a much better choice than the last actor who narrated for him, whose voice sounded too gritty and mature to be Sam. Cole and Isabel's narrators were also perfectly on point, and Jenna Lamia as Grace was a great choice as well. As an extra-special bonus, if you listen to the audiobook, the last two tracks are original music pieces composed by Stiefvater herself who is not only is she a gifted author, but she is clearly talented in many other artistic endeavors as well. Even if you've already read the book, I would recommend listening to the audiobook because it is an experience unto itself. There is no doubt in my mind now that I want to finish this series. While I was initially skeptical and almost tragically let this series go, I've already got my copy of Forever waiting for me to start reading as soon as I hit "publish post." I'm looking forward to going to see Maggie at her book signing at the Borders in Novi this Monday, July 18th. Is anyone else reading this blog right now going? I don't have much experience with paranormal romance so I think I could at least give this series a try on audio.